Intent to Participate Deadline to be printed in souvenir Commencement book. The Intent to Participate form link has been sent on Thursday, April 18, 2019 to eligible students who have submitted their graduation application. Please check your e-mail for the Intent to Participate from commence@ucr.edu for your unique link to create a password and register for your Commencement ceremony. Please note, ticket ordering will open on Wednesday, May 15, 2019. Information regarding how and when to order your guest tickets will be sent via e-mail to registered students the week of May 6. If you did not receive the Intent to Participate form and you expect to be graduating this Spring, please make sure that you have submitted your two-step graduation application through R'Web. Welcome to the official Website for UC Riverside's 65th Commencement to be held May 31-June 1 and June 14-19, 2019. If you are a graduating student, congratulations on your achievement! You have worked hard to get this point of your life and UC Riverside is honored to have been part of your journey. Making this day a memorable occasion for you and your proud family members and friends is very important to UC Riverside, so we have developed this website for everything Commencement. Additional details will be posted to this site as they become available, so please check back periodically and stay updated! Step 1: Confirm that you are eligible to graduate. Students who expect to graduate Fall 2018, Winter 2019 or Spring 2019 are eligible to participate in Commencement 2019. Students who expect to graduate Summer 2019 are not automatically eligible to participate but may do so if the early deadlines and requirement are met. Step 2: Check out our graduation checklists to make sure you are on track with the graduation application deadlines and requirements. Check out our graduation checklists to make sure you are on track with the graduation application deadlines and requirements. Undergraduate students must submit a two-step graduation application, starting with the R'Web graduation application process then the College graduation application. Make sure to complete both applications to complete the application process. For Advanced degree candidates and Teaching Credential candidates, please complete the appropriate paperwork on time and receive approval from the Graduate Division and Teacher Education Program office. Step 3: Submit your Intent to Participate when the link is posted to this website, new date TBA. The Intent to Participate form confirms that you will be participating in Commencement 2019. It is important to submit your Intent to Participate by Monday, May 6 at 5:00 p.m. to ensure that you can order the maximum number of tickets for your ceremony and that your name be printed in the souvenir Commencement book. Step 4: Order your guest tickets starting May 15, 2019. Starting May 15, 2019, you can log in to Marching Order with the same login information as the Intent to Participate form to order your guest tickets. Please note that the maximum number of tickets available vary by ceremony and ticket ordering is not on a first-come, first-served basis. Each student is guaranteed the maximum number of tickets for their specific ceremony. Step 5: Let us know your plans after graduation! You've made it to graduation, but what's your next destination? Tell us your next step now! To ensure adequate seating all ceremonies will be ticketed. All guests attending must have a ticket for entry. Seating is on a first-come, first-served basis. Children 2 and under do not need a ticket but will need to remain on a parent's lap for the duration of the ceremony. The actual number of guest tickets available to each candidate will depend upon the number of candidates attending each ceremony. Please visit your ceremony webpage for information specific to your ceremony. UCR Commencement tickets are the property of the University and are issued to participating graduates at no charge. The sale, purchase, or duplication of Commencement tickets is strictly prohibited. If you file your graduation application on time (see your checklist for deadlines) and are approved by your College/School or the Graduate Division to participate at Commencement, you may register for Commencement online via the Intent to Participate form. A link to the Intent to Participate form and login instructions will be emailed to eligible students, new date TBA. Starting May 15, 2019, please log back into Marching Order to order your guest tickets. Please note that the maximum number of tickets available vary by ceremony and ticket ordering is not on a first-come, first-served basis. Each student is guaranteed the maximum number of tickets for their specific ceremony. Once you submit your ticket order, you will be given the option to either print or electronically distribute your tickets via email. Each ticket will have a unique barcode and may only be scanned once for admittance. Duplicate tickets will be denied entrance. When you order your UCR Commencement tickets, you will be given the option to either print or electronically distribute your tickets via email. Each ticket will have a unique barcode and may only be scanned once for admittance. Duplicate tickets will be denied entrance. Information regarding the availability of additional tickets will be announced at the end of May 2019. UC Riverside is located near the convergence of the 91-60-215 freeways in the city of Riverside. Student Recreation Center Ceremonies (May 31 - June 1, 2019): General guest parking is available in Lot 13. Parking for guests who require mobility assistance is available in Lot 24. Shuttles will be available to transport these guests to and from the Commencement venue. Pierce Lawn Ceremonies (June 14 - June 17, 2019): Starting on Friday, June 14 through Sunday, June 16 general commencement parking is available in all parking lots EXCEPT Lot 6, 19 and residence hall Lots 14, 15, 21 and 22. On Monday, June 17 Lot 1 will be reserved for UCR permit holders only, but all other lots EXCEPT 6, 19 and residence hall lots 14,15, 21 and 22 will be open for commencement parking. Lot 6 is reserved for guests with a disabled person plate or placard and guests who require mobility assistance. Shuttle Vehicles will be available to drive guests who require mobility assistance to and from Lot 6 to the Commencement venue. Tickets are required for entrance to all UCR Commencement ceremonies. Please see the Tickets page for more information. Seating for all ceremonies is on a first-come, first-served basis. Guests who are sensitive to heat and sun may view the ceremony in University Lecture Hall or Watkins 1000 for the Pierce Lawn ceremonies. These lecture halls have climate-control and will show a live video-feed of the ceremony on a large screen. No tickets are required for entrance into these locations. 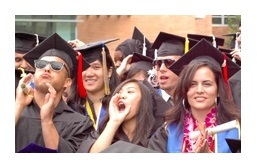 In addition, each of UCR's Commencement ceremonies will be webcast live. Links to each ceremony's webcast will be provided on the Commencement home page. Student Recreation Center Ceremonies (May 31 - June 1, 2019): Parking for guests who require mobility assistance is available in Lot 24. Shuttles will be available to transport these guests to and from the Commencement venue. Pierce Lawn Ceremonies (June 14 - June 17, 2019): Lot 6 is reserved for guests with a disabled person plate or placard and guests who require mobility assistance. Shuttle Vehicles will be available to drive guests who require mobility assistance to and from Lot 6 to the Commencement venue. The university does not provide wheelchairs. If you or a family member attending needs the assistance of a wheelchair, we urge you to use your own or rent one to bring to campus for the day. An American Sign Language interpreter will be present at each ceremony. If you are an individual with a disability, or you are inviting a guest who needs special assistance, and have additional questions about Commencement, please email Laura Blevins or call (951) 827-3144. UCR is very proud of the accomplishments of each and every student, so we want the ceremony to be a pleasant experience for everyone. This time-honored ritual includes traditional academic regalia and requires proper decorum. We ask you to respect the rights and feelings of other participants and guests by remaining in your seat until all of the graduates have been recognized and the ceremony has concluded. In consideration of the speakers, the graduates, and so that guests' views of the platform are not obstructed, no air horns, beach balls, balloons, signs of any size or other distracting objects will be allowed into the venue. Pagers and cell phones should be turned off or to silent mode during the ceremony. Please consider the safety of others and do not stand in or block the aisles or walkways of the venue. Smoking and tobacco use are not permitted on university property. Many Riverside area hotels offer special rates to UCR visitors. Please inquire about receiving a UCR rate when you make your reservations. Visit the Riverside Convention Bureau web site for a list of area hotels. Although UC Riverside does not anticipate any security problems during Commencement, we will be taking special measures to ensure the safety of everyone who attends Commencement. Security will be screening at the venue. A souvenir commencement book, listing the names of all of the graduates, may be purchased for $5.00 at each of the ceremonies. Participating graduates will receive one complimentary copy when they check-in for their ceremony. Commencement T-shirts will be available for purchase before and after each ceremony. A flower vendor will be on-site at each of the ceremonies offering congratulatory flower bouquets and leis for purchase. The UCR Campus Store will be open for Commencement and offers a wide selection of UCR gear, memorabilia and gift items. Store hours for Commencement weekend will be announced during Winter Quarter. The UCR Dining hours for Commencement weekend will be announced during Winter Quarter. The UCR Pipe Band performs on the campus and surrounding community at formal and informal events, including parades, memorials, highland games, athletic events, alumni events, Chancellor's events and Commencement. The band encompasses a diverse group of musicians and performers offering a wide variety of Celtic music played on bagpipes and drums. Visit their website to find out more about the UCR Pipe Band. The open book, which symbolized the accumulation and dissemination of knowledge. The letter "A", representing the beginning of wisdom. The five-pointed star above the book represents the discovery and sharing of knowledge. The University motto, "Fiat Lux", or "Let There be Light", displayed on a scroll, represents the coming of light and knowledge in to the world. The Chancellor's Medal is worn at ceremonial observances as a part of the chancellor's regalia. At the center is the University of California seal. The back of the medal displays the names of the campus' chancellors and year he or she was inaugurated. The academic mace, first used in the 14th century, is descended from the club of Hercules. The scepter on the mace stands for lawful power and regal authority, and was carried by Zeus, the Greek God of moral law and order. Most academic maces take the same general shape. At the top is an ornament placed on a bulbous head; ring-shaped enlargements are found on the shaft; and the base is a round, foliated ornament. The UC Riverside Mace was first suggested by Ramon J. Rhine, Chair of the Academic Senate, to represent the dignity and history of the campus. Professor Emeritus George Helmkamp designed and constructed the ceremonial mace, with Eugene L. Ethridge of the Chemistry Department contributing metal work. The UC Riverside mace was hand crafted with inlaid woods, with the head and shaft made out of Hawaiian Koa wood. The light inlaid wood is Yellow Fir from Canada, and the dark inlays are Desert Ironwood collected by Professor Helmkamp throughout Southern California. The mace has ornaments at the top and the base. The base is in the shape of a citrus fruit, representing UCR's Citrus Experiment Station. The top ornament is the bear of the State of California. 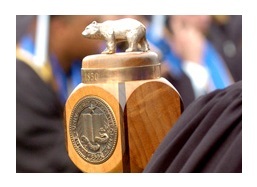 Seals of California and the University are mounted on opposite sides of the mace's head. Below the seals are the mottos of California and the University, respectively, along with the years 1850 (the year California was admitted in to the Union), and 1868 (the year the University of California was founded). Professor of Music Byron Adams joined the UCR faculty in 1987 and was dismayed to discover that the university did not have a school song. To promote school spirit and engender institutional pride, Adams held an informal competition for the text of the song and selected the verses written by the late Bob Wild, a beloved physics professor. He then set forth to create "Hail Fair UCR". "I sat down one beautiful winter afternoon and, inspired by the hills surrounding the university, the bell tower and the orange groves, composed Hail Fair UCR," he said. "It is meant to be sung in full - every word and every note - at Commencement and other solemn, and not so solemn, university events." Download a PDF of the music and lyrics of the alma mater. Relive the pageantry and excitement of UCR’s Commencement ceremonies. Watch videos of the keynote and student speakers from each of the ceremonies as well as the remarks from our Chancellor and Deans of the Colleges. Watch the ceremonies from UCR's 64th Commencement exercises, June 1 and June 15-19, 2018. Watch the ceremonies from UCR's 63rd Commencement exercises, June 9 and June 16–19, 2017. Watch the ceremonies from UCR's 62nd Commencement exercises, June 10–13, 2016. Watch the ceremonies from UCR's 61st Commencement exercises, June 12–15, 2015. Watch the ceremonies from UCR's 60th Commencement exercises, June 13–16, 2014. Watch the ceremonies from UCR's 59th Commencement exercises, June 14–17, 2013. Watch the ceremonies and view photos from UCR's 58th Commencement exercises, June 15–18, 2012. Watch the ceremonies and view photos from UCR's 57th Commencement exercises, June 10–13, 2011. Information for all candidates for graduation, including those receiving Bachelor's Degrees, Advanced Degrees or Teaching Credentials. Includes links to checklists that help ensure all requirements and deadlines for participation in Commencement are met and other important information regarding Commencement. Information and registration for all ladder-rank faculty, adjunct professors, visiting faculty, lecturers, and supervisors of teacher education who wish to attend and participate in the faculty procession. Information and registration for UCR Commencement staff and volunteers assisting in the administration of the event.